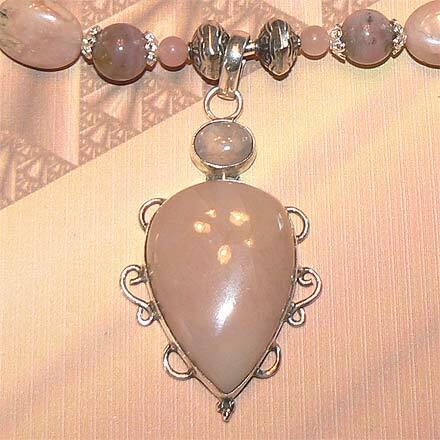 Sterling Silver Pink Peruvian Opal, Rose and Milky/White Quartz Necklace. See Closeup. 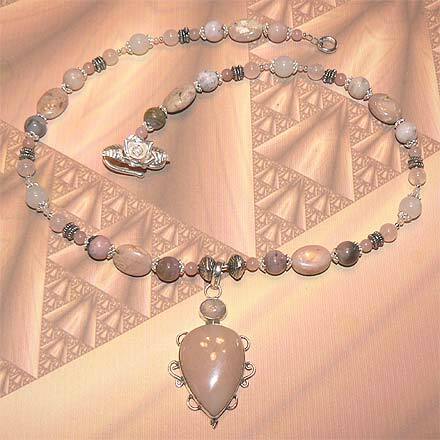 I always like to get matching beads to correspond with the pendant stones, but I couldn't tell whether the little cabachon atop the larger Pink Opal was Rose or White Quartz, so I used both kinds of stone beads in this jewelry set throughout. I remember making this one when our new kitten was still in quarantine from our other cat, and remarking on how pink he was, just like the Pink Opal! Please note that colored opals like pink, blue or yellow are "common" opal that do not show the play of color like precious opal, but they are lovely semi-precious gemstones in their own right, similar to Chalcedony, Agate and Jasper. For those who are interested in birthstones, Quartz corresponds with Taurus.